Next to labor expenses, the cost of fuel to operate big rigs is the most daunting challenge to the bottom line of any trucking company. A typical 18-wheel truck gets just under 6 gallons-per-mile and most average over 110,000 miles every year. It’s not hard to see that improvements in that MPG figure, no matter how modest, can exert a meaningful impact on profits when extrapolated over typical annual mileage. A truck maintained and operated for maximum fuel efficiency is also often a vehicle with a longer expected service life and fewer repair issues during that lifespan. While advances in engine technology continue to deliver increases in MPG, it’s not necessary to wait for the next big breakthrough to start increasing fuel efficiency. Here are four things fleet managers and drivers can do now to squeeze extra miles out of every gallon. The most controllable factor in fuel efficiency is entirely in the hands of the driver—actually under his or her right foot. Easing up on the accelerator and keeping speed in the efficient range pays off from day one. Just reducing the average speed of a big rig from 75 mph to 65 mph reduces fuel consumption by more than 25%, substantial savings that don't require investments in high technology or upgrading your fleet to new vehicles. Many large fleets already incorporate limiters that hold speed to 62 mph and the Department Of Transportation is now proposing mandatory limiters for all heavy-duty trucks. With proper driver training, however, you don’t have to wait for future legislation to start saving fuel now. Aerodynamic drag makes engines work harder, in turn consuming more fuel. Cutting wind resistance by 25% could increase fuel efficiency by 15% and result in hundreds of dollars of savings per year. Most of this is accomplished on the trailer: reducing the gap between the trailer and the tractor cuts air turbulence, adding side skirts and streamlined front and rear bulkheads also enhance aerodynamics and efficiency. The high profile of freight strapped to an open flatbed is another major generator of air resistance. Curtainside trailers that enclose freight completely will substantially cut resistance and also eliminate tarps that catch air and contribute drag. Some idling simply can’t be avoided: if a driver is in stop-and-go traffic, he can hardly be expected to turn off the engine every time traffic grinds to a halt. However, other types of idling can be at least reduced. 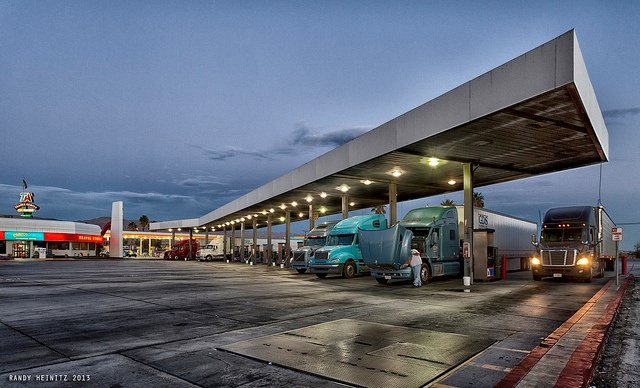 The Environmental Protection Agency estimates that truck fleets could save an average of $6000 a year in fuel costs by reducing discretionary idling when and where possible. Scenarios such as an unexpected delay at a loading dock provide the opportunity to shut off the engine for those extra few minutes and save fuel. Also, investment in smaller diesel-power APUs that use less fuel to maintain air conditioning, heat and interior accessories without idling the big engine more than pay for themselves over the long run of lower fuel expenses. A recent survey found that about half the tires on semi-trailer trucks were below specified air pressure. Under-inflated tires add rolling resistance that impacts fuel efficiency every mile the truck travels. A big rig tire that is just 10 psi below specified inflation costs you 1% in reduced fuel efficiency. Truck tires typically lose about 2 psi of pressure per month. Therefore, when inflation on a truck isn’t checked regularly it’s rare that just one tire is below specs. When multiple tires on one truck are low, fuel efficiency reduction is also multiplied many times.